Julia Jacobs, a natural resources policy and administration student, solidified her aspiration to become a conservation scientist while studying abroad this summer. 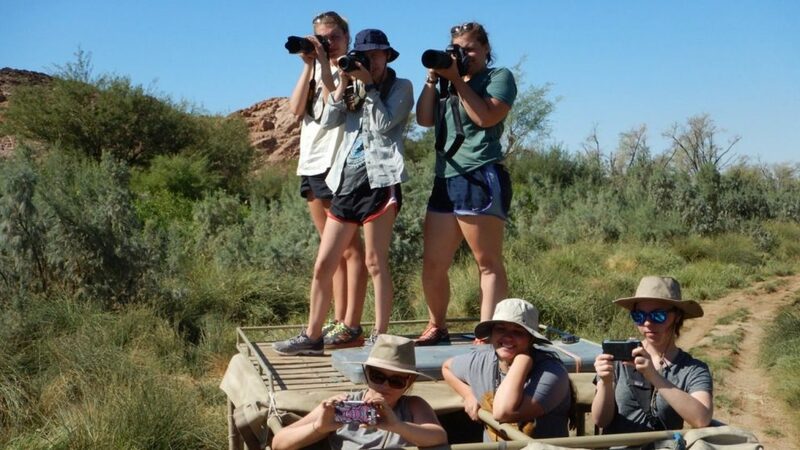 The trip to Namibia, which was supported by the College of Natural Resources Enrichment Fund, allowed Julia to supplement her formal education with hands-on research experience. Tell us about your study abroad experience. I spent three weeks in Namibia studying desert ecology and conservation. I have worked with photo trapping research and radio telemetry in the past, so it was cool that this study abroad allowed me to practice those skills on different species and in different ecosystems. We had the opportunity to do fieldwork in multiple desert areas, participating in activities such as tracking wild elephants and completing population surveys in Etosha National Park. I was lucky to have two amazing guides who taught us a great deal about each ecosystem we visited. How has your study abroad experience prepared you for your career? Ultimately, I would love to be a conservation science professor so that I can both teach and conduct research. This experience helped me to practice research techniques and gain knowledge about foreign conservation practices. This trip was an amazing experience and strengthened my dream to become a college professor! Why would you recommend your major to incoming students? The natural resources policy and administration major opens many doors in a wide variety of fields. I have been able to add minors in applied ecology and wildlife sciences that have provided me with more technical knowledge. 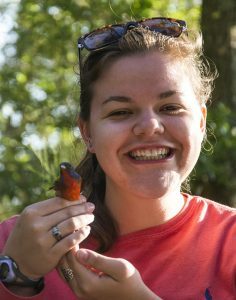 I have also had the experience to intern in the North Carolina Museum of Natural Sciences and spent a summer working as a field technician doing telemetry work on painted bunting birds. All of those doors were opened in part due to my experiences and knowledge gained through my major. What advice do you have for students considering your major? Take advantage of all of the opportunities and faculty willing to help you. There are so many experiences that will add to the classroom learning that you have to take the initiative to get, but that are so worth it when you do. Learn more about the 2016 CNR Enrichment Fund Scholars’ summer experiences.